With a professional driveway cleaning service you’ll be able to bring new life to your home’s exterior, and a range of surfaces can be restored to their former self. High force industrial power wash cleaners with a detachable flat surface system are often used to rid the driveway of grime, moss and other unwanted extras. 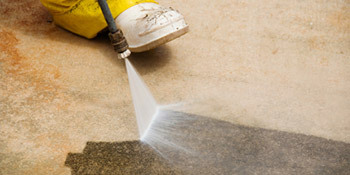 There are no chemicals used in the cleaning process, making treatment environmentally friendly. On top of this, the flat surface avoids lines caused from power washing tools. By having your driveway, pavement or patio area professionally cleaned you can instantly restore life and create a great first impression on everyone. Custom built washing equipment will soon have your surfaces looking brand new once again. Even though it may only be pavement, it’s the first impressions that count, especially if you’re trying to sell your home. Protecting the exterior of your home with a driveway can be big investment, which makes it essential to have the surface professionally maintained. By having algae, grime, weeds, moss and more removed, you can continue to have a brilliant finish for your front area. In fact, the resealing and sanding of your driveway will add even more to the future protection and keep the surface in tip-top condition for years to come. Driveway cleaning will restore new life to your home’s exterior and ensure the paving is sufficiently protected for years to come. If you’re interested in having your driveway professionally cleaned, complete our quick form and receive up to four FREE quotes from local, vetted and reputable specialists in the industry. Project: Driveway block paving and back garden sandstone slabs cleaning and sealing. They were helpful in finding a company to give me a quote. You promptly found me three companies and I found this most helpful, so thank you. I don’t like having to rate companies I haven’t used and didn’t ask for quotes!